In news that shocks no one, Star Wars is kind of a big deal again. With the successful billion dollar box office trouncing that is Star Wars Episode VII: The Force Awakens, it’s not surprising that the followup projects to the reinvigorated franchise are drawing more attention. 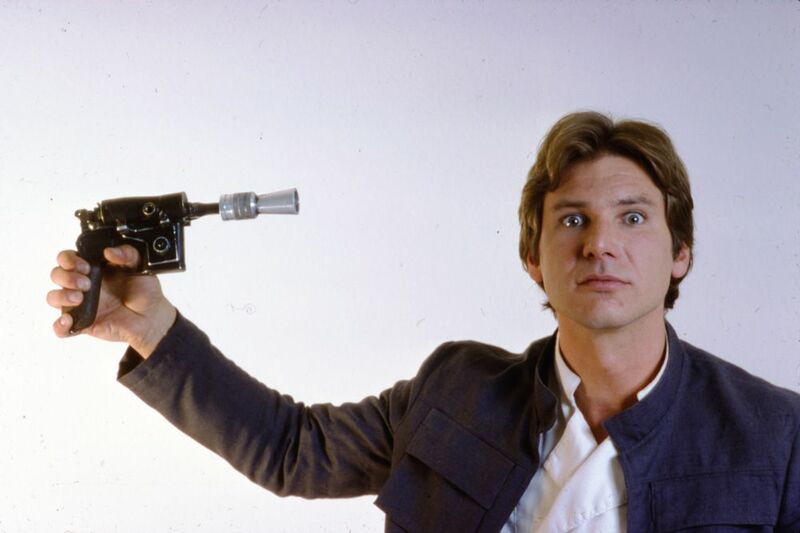 Specifically, the young Han Solo movie being written by Empire Strikes Back and Force Awakens co-writer Lawrence Kasdan and his son, Jake, which will be directed by Chris Miller and Phil Lord (The LEGO Movie, 21 Jump Street). While the movie won’t be released until 2018, a shortlist of actors was revealed though the response from fans had about as much excitement as Arthur and his Knights eating Sir Robin’s minstrels. I mean, what’s not to get excited about when you see the same list of young actors from every YA movie adaptation? Look, I know Han Solo is an iconic character to a lot of people. I get that. I love Harrison Ford and I love the Han Solo he created in the original trilogy and The Force Awakens. But let’s be honest, Han requires about as much backstory as Boba Fett – zero. Han exists within the Star Wars universe as a philosophical foil for Luke (hokey religions and whatnot) and a romantic partner for Leia. He’s a pirate, a ne’er-do-well, a lovable rogue, and an archetypal character of the monomyth. Making a prequel movie feels like it might go the way of X-Men Origins: Wolverine in that Han can’t grow all that much because he needs to be at a certain place in order to match up with A New Hope. That kinda limits you since his character development only happens within the original trilogy and, presumably, the thirty year gap between Return of the Jedi and The Force Awakens. Plus, the upcoming Rogue One, due for release in December of this year, is being described as a heist movie, which kinda takes the wind out of the sails of a movie focusing on a smuggler two years later. Really, the best we can hope for is the movie hinging on Han’s friendship with Chewbacca because if they do a “how Han Solo got the Millennium Falcon” type movie I swear to God I’m putting a blaster to my head. For my money’s worth, the movie will probably be about the Kessel Run. My point is that Han’s story is really only of interest when it intersects with the activities of the rebels. His selfishness is paramount to his triumphant return at the end of A New Hope and his “reluctant” yet continuing association with the rebellion throughout Empire Strikes Back and Return of the Jedi. The same goes for Luke. He’s drawn into the rebellion through happenstance and thus learns about his true heritage and “destiny,” I guess. 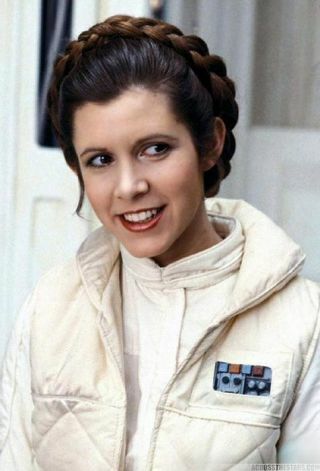 But the final member of the heroic trio has been involved with the rebellion for much longer and it’s really because of her that there’s any Star Wars to begin with. 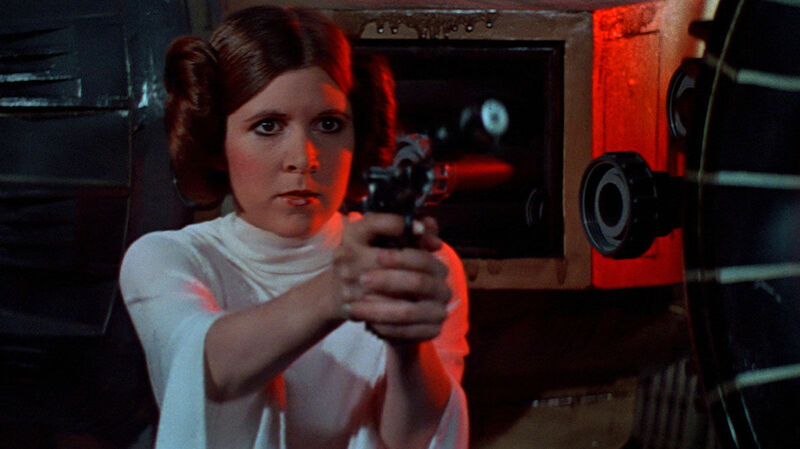 I’m talking about Princess Leia Organa and she deserves a prequel movie more than anyone! Think about it: Leia is the princess of Alderaan who becomes integral to the rebellion’s survival by the beginning of A New Hope. She’s the one carrying the stolen plans to the Death Star and it’s because of her resourcefulness that R2-D2 gets away to deliver those plans, and her message, to Obi-Wan Kenobi and Luke Skywalker. Without Leia there is no hero’s journey for Luke and there’s definitely no turn-a-new-leaf story for Han. So what made Leia go from Princess to Rebel Leader? What pushed her into the crosshairs of a war with the Empire? Because that sounds way more compelling than the Smuggler’s Life movie in the works for Han. It’s essentially a coming of age movie that starts the moment Leia is adopted by Bail and Breha Organa and ends with her decision to commit to the rebellion. I mean, if you want an easy way for a movie prequel to tie into the anthology films, then this is it. Rogue One ends with the plans stolen and the Princess Leia film ends with her taking on the role of envoy to ensure the plans make it to the rebellion headquarters. The last shot is of her ship heading towards the beginning of A New Hope. Yeah, Leia had to have known she was adopted by the events of Star Wars, which opens up a lot of storytelling potential. 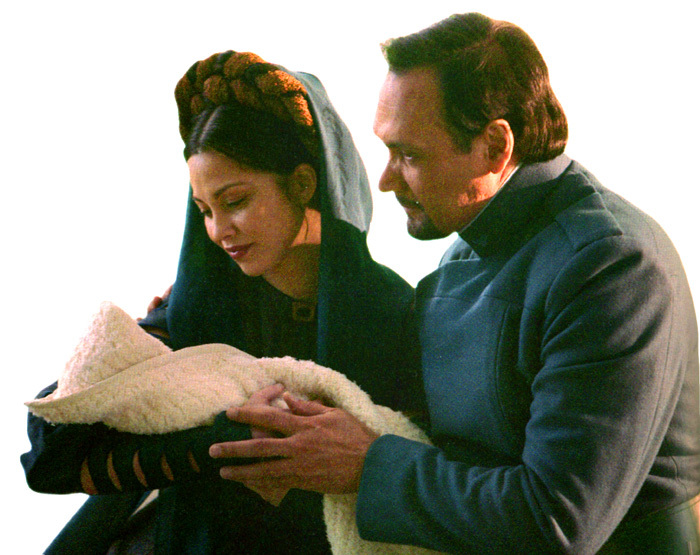 How do the Organa’s explain their new daughter’s appearance? Has the Empire been keeping tabs on Leia the whole time? And since Bail knows Leia’s biological father was a very powerful Jedi, would he take steps to help her should she show signs of Force sensitivity? How would he take steps to help her if the Jedi have gone into hiding? Leia’s prickly personality would certainly factor into the progression of the story as well. It’s clear, in hindsight, that Leia takes after Anakin more than Luke who tends to have more of Padme’s traits. Leia is strong-willed, stubborn, capable, and headstrong. 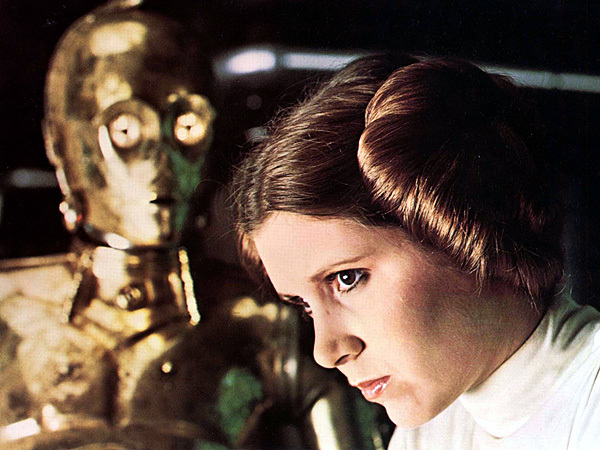 Yes, she has a nurturing and romantic side, but Leia proves throughout the original trilogy that she’s a force to be reckoned with all on her own. Some of that could stem from being adopted and her sense of self-worth. Joining the rebellion may have given her something of importance to work towards, something that would make her feel like the title of “Princess” wasn’t just handed over but earned. Alternatively, Leia joining the rebellion could be her own act of rebellion. Perhaps Bail and Breha tried to keep a low profile under the thumb of the Empire to protect their daughter, but all Leia sees are her parents being subservient to the Empire’s cruelty. Furious at them, she takes more and more risks while helping the rebels, which puts her on the Empire’s watch list. And as a third option, Leia’s story could easily be about a high-born young woman whose eyes are opened to the truth of the Empire’s rule. She has everything and yet realizes it means nothing in a galaxy where the Empire reigns. I’m also aware that Star Wars Rebels will feature a teenage Leia in an upcoming episode, which is fantastic. It’s not surprising given the timeline of Rebels and how close the show is getting to the events of the original trilogy. But if Disney and Lucasfilm want to continue doing anthology films within the Star Wars universe, complete with prequels, then lining up Leia’s story matters just as much, if not more, than Han’s. Besides, Leia’s got a sharp tongue on her as well. You want some real fun? Let’s see what a typical day in the Alderaan court is like when Leia gets political. I don’t know about all of you, but I’m a sucker for ambitious storytelling. Sure, I love my paint-by-numbers comics, but when you can clearly see a team of artists aspiring for something more it makes the downtime between monthly installments all the sweeter. With each issue we get another building block, another piece of the puzzle and half of the fun is the challenge presented in the work to the reader. Yes, you can read a comic in under fifteen minutes, but it’s the well-crafted and impassioned books that draw you in and invite you to take a closer look. Pisces, with only two issues, is proving itself to be such a book. Home from the war in Vietnam, former fighter pilot Dillon Carpenter finds adjusting to civilian life to be as much of a battle as the one he left behind. Carrying the burden of what he did during the war to survive, Dillon is continually haunted by his demons both real and imagined. A chance meeting with a fellow veteran, however, gives him the opportunity to find a modicum of peace, but a momentary reprieve isn’t enough to keep the past and the present from colliding. 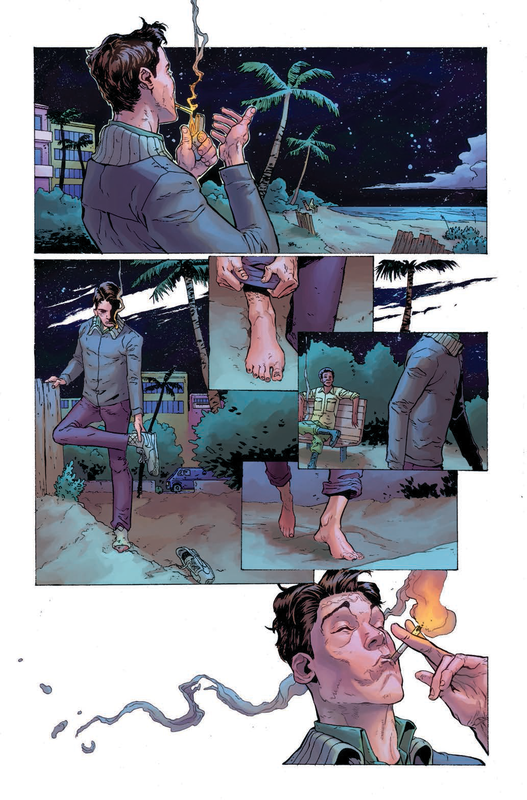 The description may be fairly straightforward but within the issue proper writer Kurtis Wiebe, artist Johnnie Christmas, and colorist Tamra Bonvillain tweak it just enough to keep us questioning reality right along with Dillon. It’s all lined up for us: veteran of a horrific war experiencing post-traumatic stress that manifests as equally horrific hallucinations. Pretty much every Vietnam movie covers this. Except there’s a sinister quality to Dillon’s visions. His demons arrive in the form of a viscous liquid with melting phantasms attempting to pull him under, to drown him in a watery starscape. The continued use of water holds up less as a method of narrative transition and more as a manifestation of his psyche. 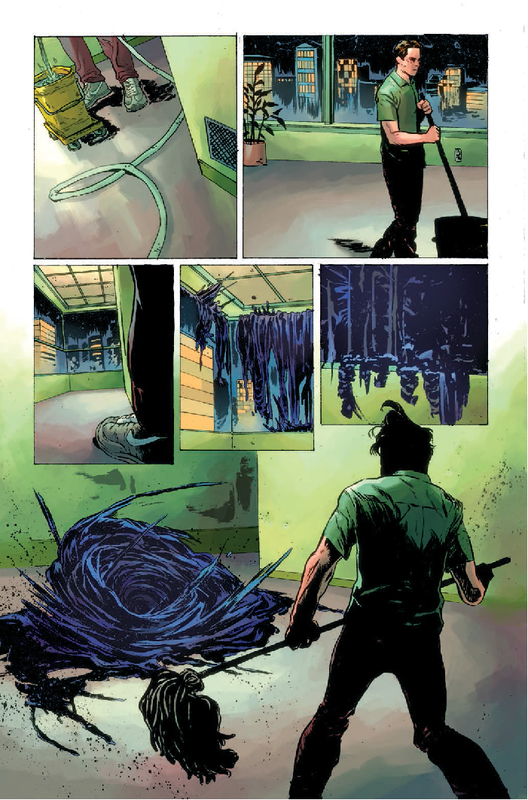 Pisces #2 really highlights how the script and the art hold equal weight in telling the story. So far, Wiebe has been light on exposition. He’s letting the characters drive the plot and since we’re dealing with a questionable reality, nothing appears to make sense. Memories, visions, nightmares all blend together but without context we as the reader are hung out to dry about the actual meaning. Dillon is even less forthcoming with an explanation because he isn’t sure himself and he really isn’t the type to wax poetic about his feelings. Without our own solid foundation from the words, we turn to the art for help. It’s worth noting that Christmas’ art continues to be stunning throughout the issue. He manages to make distortion and elongation of panels and appendages look amazing but he can just as easily nail an expression that tells you everything about a character with one glance. 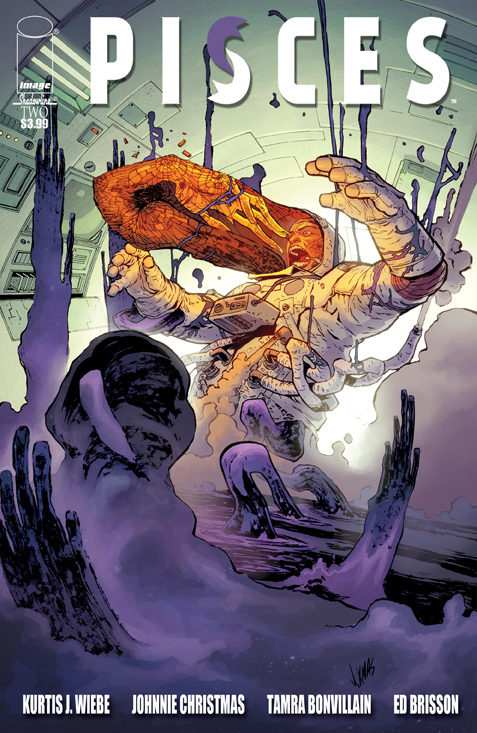 And Bonvillain’s colors bring as much vibrancy to a quiet conversation in the moonlight as they do to a whirling black hole of starry nightmares. The art, however, is just as unreliable as it quickly turns, taking any solid foundation of reality and morphing into hellish dreams. Like the mind, Dillon’s world is fluid and subject to change without warning. Add in the nonlinear narrative and our ability to gauge the situation is nonexistent. It’s exciting but it also holds just enough tension and anxiety with each turn of the page, which is exactly where you want to be in the horror/thriller genre. The best pieces of horror are less about gore and more about anxiety and fear – fear of the unknown, of the people around us, of our own bodies, etc. Our senses are heightened, the heart beats faster, and we’re just waiting to let out a scream to relieve our minds of the stress induced by sustained suspense. Pisces is only in the first stages, setting the tone where the quiet moments linger with uncertainty. Every corner has the potential to sink into oblivion, every person a possible figment of an addled mind. As Dillon falls, we fall with him and there’s nothing to hold on to. Isn’t that just a little bit frightening? But isn’t it also just a little bit fun?